JEDDAH, Saudi Arabia--(BUSINESS WIRE)--Saudi National Day celebrations continue apace through the holiday weekend, with a series of spectacular entertainment events across the Kingdom highlighting the country’s achievements. According to the General Entertainment Authority - the body responsible for expanding the entertainment sector under Vision 2030 - a total of 27 events were planned this weekend in 17 cities to mark the 87th National Day, observed on September 23. The events include concerts, plays, displays, comedy, laser, air balloon, cultural and sports shows, as well as folk dances, and are held in Riyadh, Jeddah, Dammam, Ha’il, Tabuk and other cities. A major music concert at Al Jowharah Stadium in Jeddah featured prominent Saudi and Gulf singers. Riyadh’s 99-story Kingdom Centre was illuminated against the night sky on Saturday with portraits of King Salman and Crown Prince Mohammed bin Salman. 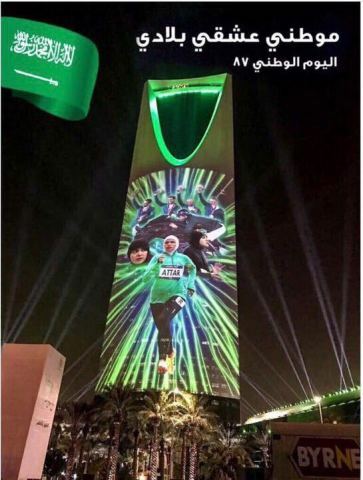 Kingdom Centre was also adorned with portraits of famous women such as track athlete Sarah Al Attar and sprinter Kariman Abuljadayel, who were part of the Saudi team at the Rio Olympics. 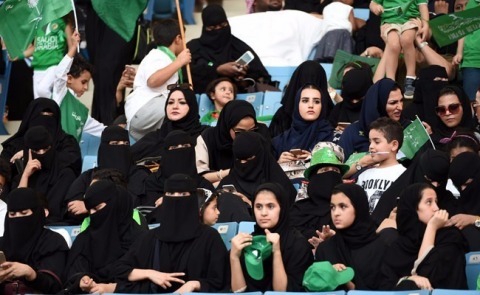 As a reflection of the promise of Vision 2030’s vibrant and inclusive society, women attended all events, including in King Fahd International stadium which opened its doors to everyone for the first time. Packed audiences attended a musical performance and a staging of the National Epic operetta on Saudi history. “We see our country, thanks be to God, as an active member of the G20, a group that comprises the world’s strongest economies. With tremendous ambition, we look forward to the Kingdom becoming a pioneering model in all respects, relying on the roles played by our young male and female citizens, as we strive to achieve the goals of the Kingdom’s Vision 2030,” Crown Prince Mohammed bin Salman said in a speech.